In this week’s episode, Robert and I discuss two large venture capital investments in the content marketing technology space – Percolate and Kapost. We also debate whether Facebook’s launch of its Instant Articles service represents the end of times for publishers or a stairway to heaven. 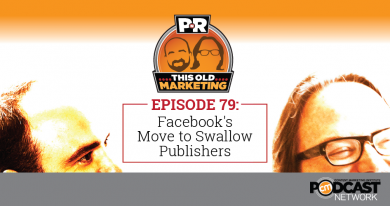 After discussing whether brands could really create a Mad Men-type show, Robert and I rant and rave about Adobe’s new audio white papers and a huge media purchase by one of the world’s largest action sports retailers. We wrap up the show with a #ThisOldMarketing example from Poor Richard’s Almanack. Showing PNR listeners some love (4:52): We love our PNR listeners. That’s why we’re giving you some extra love. Listen to the podcast to find out about an exclusive discount – just for you! Money, money, money – money… but really content marketing? (7:11): Content marketing technology firm Percolate has announced that it has raised $40 million in Series C financing. This latest round of venture capital investment brings Percolate’s total funding to $74.5 million. Kapost also announced it has secured $10.25 million in new funding to accelerate the company’s growth. Robert noticed that both Percolate and Kapost have eschewed content marketing to focus on their own big-picture concepts like “marketing content.” Robert and I discuss what it means to be “the marketing system of record” and whether or not a single technology tool can manage this far-reaching role. Why Facebook’s news experiment matters to readers (19:24): Facebook’s new plan to host news publications’ stories directly on its site is significant, not because of page views, advertising revenue or the number of seconds it takes for an article to load. It is about who owns the relationship with readers. So says The New York Times UpShot column. This raises some serious journalistic questions about which articles get shown on Facebook and which get ignored. Robert and I ponder the pros and cons of media companies posting their content on Facebook and Google. Could a brand make the next Mad Men? (30:32): A new article by Aaron Taube on Vice questions if a popular TV show like AMC’s Mad Men could ever be produced by a brand. After interviewing a number of marketing and branding experts, he comes to the conclusion that it couldn’t happen because brands have a different agenda – usually to sell something – that colors how they craft content. Robert and I disagree with his contention that the future will be filled with “insipid, brand-safe drivel.” TV and radio shows have had sponsors for almost as long as these media have been around. We believe it is possible for a brand to create a show like Mad Men. This Old Marketing is sponsored by ConnectiveDX (formerly ISITE Design), an agency that helps organizations bring together the customer insight, design, and technology capabilities necessary to build delightful digital experiences. 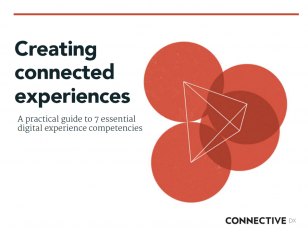 It’s offering a new report entitled Creating Connected Experiences that outlines seven essential digital experience competencies, shares relevant data and insights on the shifting digital landscape, delivers best practices for delivering digital experiences that differentiate, and provides tips and tools for mapping customer insight, vision and content. Learn more at http://bit.ly/connective-dx-guide. Joe’s rant/rave: Adobe is promoting a new series of “audio white papers” that promises to teach marketing professionals how to develop a mobile app marketing strategy in only 10 minutes per session. One of them is narrated by Malcolm McDowell, who brings a new level of gravitas to “the voice in your head.” I love the format, which is ideal for busy people, and I’m glad to see they’re amplifying it with native advertising. But Adobe could have done much more to take advantage of the strengths of this medium – such as rewriting the papers for the spoken word. Robert’s rave: Robert gives a big thank you to Roger C. Parker for his wonderful review of Experiences: The 7th Era of Marketing, Robert’s new book with Carla Johnson. Robert says the level of effort Roger put into writing his detailed Amazon review was extraordinary. He also gives kudos to Roger for doing an eloquent job of summarizing the book’s focus. Robert’s rave: The SurfStitch Group is the world’s largest online action sports and youth apparel online retailer. It has now become a media company with its recent acquisition of two surf lifestyle magazines. Robert cites this as an example of something he and I have been talking about on this podcast: A brand buying an existing content platform and its audience rather than attempting to build one from scratch. 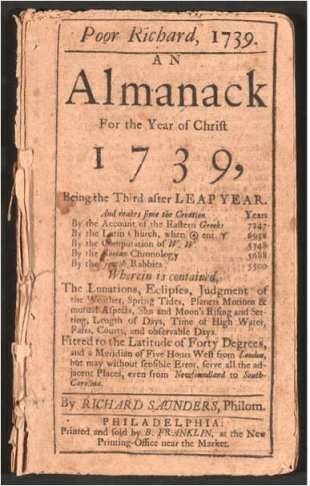 Poor Richard’s Almanack: Benjamin Franklin published the yearly Poor Richard’s Almanack under the pseudonym of Richard Saunders from 1732 to 1758 to help promote his printing business. It contained a mixture of seasonal weather forecasts, practical household hints, puzzles, and other entertaining and useful information. It was a best seller for the American colonies, with print runs of up to 10,000 per year. Franklin did such a great job at creating needed, valuable, and entertaining content for his audience that it became recognized, respected, and successful in its own right. This publication is the oldest example of content marketing we’ve discovered, which makes it an excellent example of This Old Marketing.